“Why shop at small business?” has been on my mind a lot lately. Sales have been declining enough that I’m sending employees home early, now two weeks in a row. I wonder how to get people to shop first at, and regularly with, small business like mine. I think about my own shopping habits — I am driven by convenience, price, and product selection. My income has been minimum wage and is now shrinking as my business has been increasingly targeted by mega liquor chains. Their targeting is based on making more profit. For me, it’s about survival. It’s about operating a break-even, viable business. It’s about keeping my employees on their schedules, so they know their paycheck is guaranteed regular hours. It’s about providing my customers with quality beer. So, I wonder, how do we get people to not just “think” about spending their hard-earned money with shops like mine, but to actually come in and show their support by purchasing product from us… again. And again. Regularly. Only with the regular support of the people in the City of Federal Way, and outlying neighborhoods and cities, can my business remain viable. Only with their support can my business retain its awesome employees. Only with the support of regular shoppers can we provide the level of attention that they enjoy; the recommendations that they’ve come to trust; the beer that they love. Without them, we are nothing. “Why shop local?” has been weighing heavy on my mind and heart as we’ve been hit hard by the opening of two Total Wine and More locations in the past two months. The first, 20 blocks from my store; the second, within 13 miles. A third, within similar distance, is planned. How does a small business get people to think and shop local? Daily. Weekly. Monthly. To shop with small business as part of their regular routine. I’ve been thinking about the differences in our business models: Profit vs Viability. Also about the advertisements, what’s truth, and what matters to the public. I’ve talked with my husband, my staff, my contacts in the beer industry, and even regular customers about these topics. With more input and views on the topic, perhaps, I will be able to find a solution. Together, we discuss the spin: What’s true. What’s not. I encourage you: Don’t fall for the spin. Pay attention to what matters. 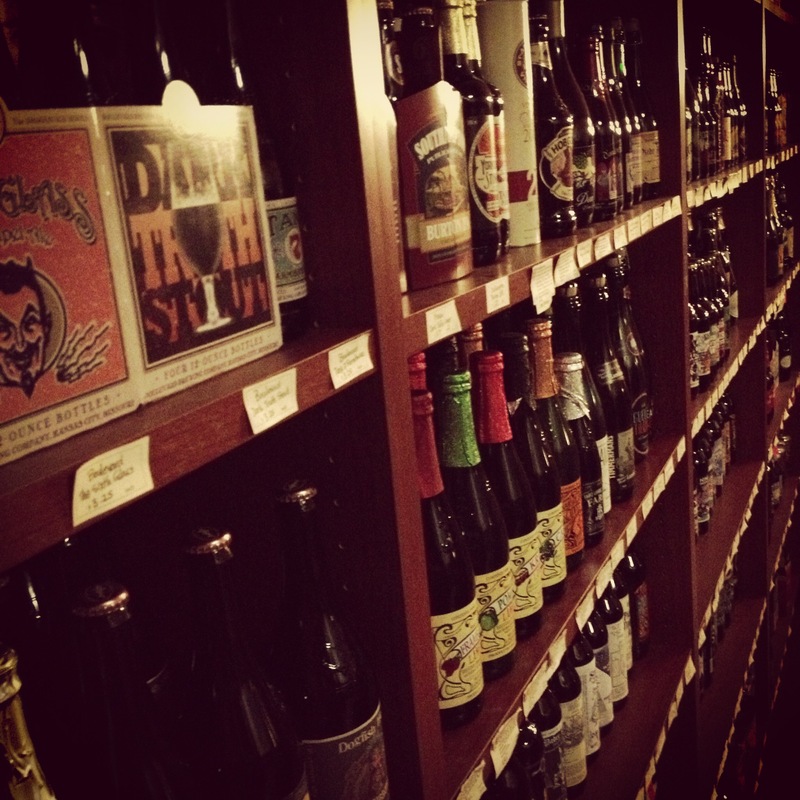 (TW&M radio) Independent beer & wine store owners are passionate about their products. Their livelihoods are dependent on their products; their lives are centered around their products. This means they’re thinking of the product not only during business hours but also after-hours. This passion comes through when they’re talking about their products. Sometimes they use words common to those well-versed in wine/beer; this doesn’t make them snobs. They’ll happily explain things in simpler terms; after all, they also started this love of beer/wine as a ‘hobby’ and can speak to casual drinkers as well as to connoisseurs. Who’s better to help you get into the right beer or wine? I’d say the person who ‘lives the product’ — that is, the folks at the independent shop where they continually experience and educate themselves on the product. In fact, My shop has one of the biggest selection of beers in Washington State, at over 1300 beers in store, with over 5000 on the books. We also carry some of the biggest selections of hard ciders and meads (honeywine). In the beer departments at my local grocery stores, fluorescent lighting and past-date craft beers are the norm. As for mega liquor stores, there’s fluorescent lighting and most craft beer is stored on ambient shelving, even the low-alcohol that have shorter shelf lives. Last year I checked out a couple of mega wine-beer-liquor stores that’ve been in business for over a year to see what products were lingering on the shelves. It was autumn and there were still a couple of displays of spring seasonal beers marked at full price. These are things I would’ve put on sale months earlier to clear out to make room for summer beers. Few beers go past-date while in my shop; my staff and I keep an eye on each beer and them on sale as ‘best-by’ dates approach. Sometimes all our supplier has is past-date and will not order fresh product in until they sell all the older product. If this is the case, and our customers are demanding the beer, we spot-check it for freshness, get it in the cooler, and mark it down. We do our best to help the suppliers and the breweries move their product while it’s still viable and delicious. We destroy products gone bad, taking the loss. If the beer doesn’t sell fast enough to stay fresh in my store, we drop it from regular inventory. It moves to “full case preorder only” simply because it doesn’t sell fast enough to “be quality” for my customer. Quality is important! The temperature of my shop is sometimes called ‘chilly’ by women coming in without jackets — but we’re focused at maintaining beer integrity of anything stored at ambient temp. The chains are focused on ‘people temperature,’ while the specialty shop is focused on the product so it’s at its best for the people. You’ve read ‘fluorescent’ twice above; all our fluorescent bulbs are encased in UV filter protection, with clear and green bottles kept off the light-bulb rows for extra protection. I tell all my staff to think of themselves as “stewards of beer” — we are simply caretakers of this wonderful product before it reaches its final destination. ‘Lowest price’ Of course, this is where it’s hardest to compete with corporate mega chains — and is of most importance to a lot of customers. The mega liquor chains post their prices on the Web and in flyers. Note the small print: “May not be valid at other locations; prices are subject to change.” We don’t advertise or publish prices except ‘estimate prices’ for those checking out keg options. Beer bottle/can prices are always changing at the wholesale level; I’m constantly reviewing and adjusting prices to remain competitive. I’ve heard other small business get up-in-arms, shouting: “Unfair! The supplier must be selling them at lower price!” For wine and spirits, there is bulk wholesale pricing. For beer it’s still illegal but it happens. Fair and equal pricing isn’t an area that’s regularly patrolled by State Liquor Officers. For ‘lowest price’ beer, what’s mostly being done is the mega liquor chain leads their ads with popular breweries as ‘loss-leaders’ — not in the true sense where money’s lost on the product, but at very low mark-ups …as low as 5%. Corporate chains establish ‘agreements’ with big craft breweries to regularly carry and sell certain beers at low prices. Though there cannot be co-advertisement between the brewery and the retailer, publicity from each can be timed to coincide, increasing the impact on the consumer. And from the brewery standpoint, this makes sense: It’s much easier to work with a single large corporate chain than to work with many small independents. 5% mark-up?! I understand as a consumer it’s hard to pass up those prices. However, as a retail shop owner, I can’t pay my staff, my rent and utilities, the fees to accept credit cards, with only 5% mark-ups. The cost of doing business is too high to run 5-15% mark-ups. For a mega chain, they can allow one location to run lower numbers as another location has higher numbers; for a small independent, it’s the one location supporting itself. I think about this over and over again. Every time it comes down to this: The people. And the quality. But, really, it’s about the people. And I’m not just talking about the people who work at the independent beer & wine stores, I’m also talking about the people who shop local. It’s true, us small business owners aren’t all smooth-operating happy-go-lucky upselling salespersons you’ll find at the mega liquor chains. Sometimes we’re tired; at my shop three of us are in overtime every week to keep things moving. At the mega liquor chains, incoming product is stocked on the shelves by the distributor — these people don’t work for the store, they work for the supplier. At the small business, incoming product is stocked on the shelves by the people employed by the small business. At the small business, you are paying for them to make sure everything’s fully stocked, faced, organized, and sparkling clean. That’s a little insight into what you’re paying for. At the mega liquor chains, the employees are coached as to what products to sell. If you frequent these 10,000-sq-ft and larger businesses several times a week and ask for the same recommendation each time, you’ll begin to notice patterns. In contrast, the independent beer/wine store is focused on figuring out what product would be best for you, for your event, for that gift. The small business wants to get you into what you’ll like. If you visit an independent shop like mine multiple times in a week and ask for the same recommendation each time, you’ll likely be shown many things. It’s an adventure, and the only agenda is to help you find something delicious. So, the very advertising point that the big businesses are using to slam small business — calling us ‘snobs’ for being experts in our products — is the biggest selling point of the independent beer and/or wine store. Why not shop with real beer and wine experts, your local independent beer & wine store? Who do you want to trust? Where you spend your money shows who you trust. Most importantly, WHERE you spend your money shows WHO you want to keep in business. If you choose to shop at mega liquor stores on a daily basis, saving the specialty shop only for special occasion, likely that small business will be out of business by the time you want that gift. It’s so important to shop local regularly. It’s only by regularly shopping with your local businesses that you develop the cool relationships that’re seen — between businesses owners and their staff and you — on shows like Seinfeld and Cheers. Shared passions. Shared lives. Shared experiences.